We need to fly that guy up here and have him walk around my Vette. I can only imagine what he would say then. LMAO! That dude on the video.. I'm totally picturing the groundskeeper character from caddyshack. I had no idea anyone in their actual rhetoric truly sounds that shot out. Its been said of him that he opens his mouth and lets the wind blow his tongue about. Last edited by johnboy; 12-04-2018 at 12:30 PM. Mike P, NTFDAY, firebird77clone and 2 others like this. "......We need to fly that guy up here and have him walk around my Vette. I can only imagine what he would say then....."
I'm guessing he would identify it as a 54 with a Blue Flame 6.....until he realized it doesn't have carbs or plugs. Anyway I sent you a PM Ryan. Ryan, coming along well, I know it's a poor excuse but my keys in my pocket scratched my phone camera so bad every pic looks like it was took in a cloud! 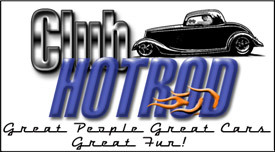 I will have to get my son to take some pics, yes I have acquired some sweet hemi parts as well. I will try to make a point to post something soon! I miss the days of the old caustic hot tanks. Years ago all the local machine shops went to Jet Washes. They do OK on dirt and grease but don't touch rust. 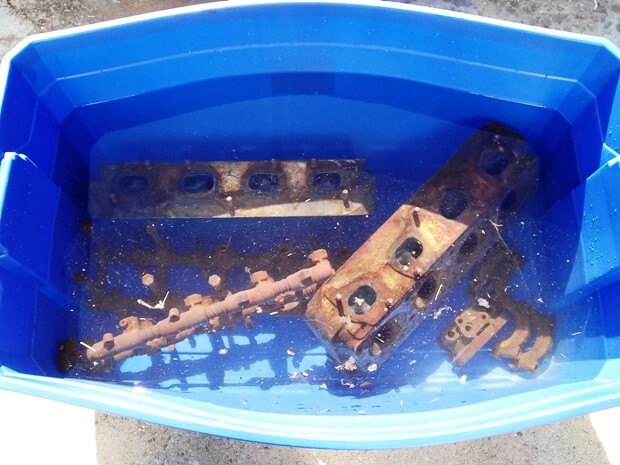 Exterior rust on blocks and heads can be bead blasted off, but it's virtually impossible to clean the water passages. I've used citric acid to de-rust other stuff and have wanted to experiment on a block and heads.......this is the perfect candidate. I bought a 5 pound bag off Amazon and the largest plastic tub Walmart carries. 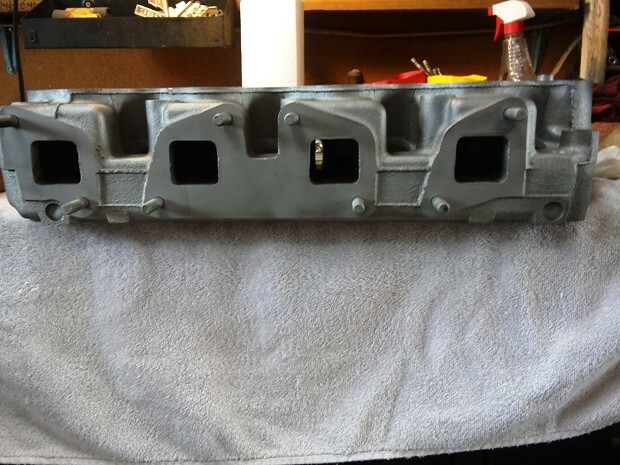 The first batch to go in was the spare set of rockers and shafts, main caps and HEMI heads. 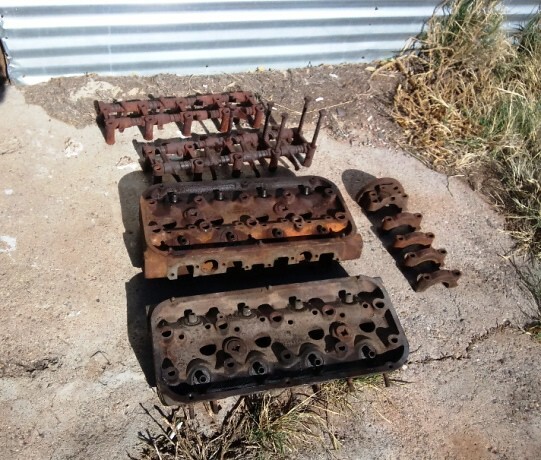 All this stuff had been sitting in the trunk of the Imperial for 40 some years and was coated with a hard rust. Five head bolts were rusted solid into the rocker stands on one set of rockers. I put the first batch in the tub filled it with enough water to completely submerge everything and mixed in about 2 pounds of the citric acid. 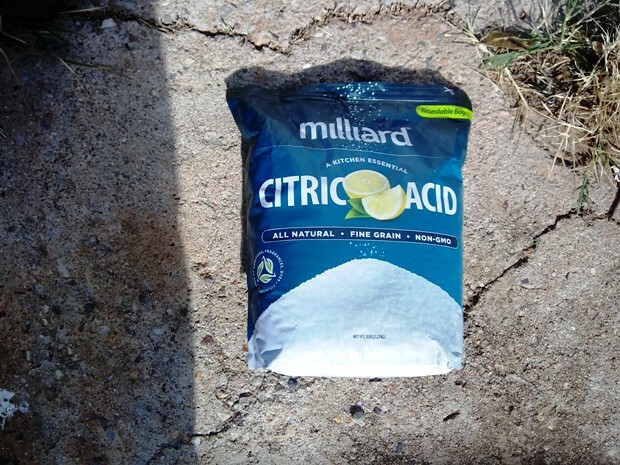 It took about 4 days and during that time I eventually added about another 2 pounds of the citric acid. I suspect it would have only taken a couple of days had I done this in the summer when it was warmer........It was only getting into the 60s during the day and almost freezing at night. I took the caps and rockers out after the 4 days (decided to give the heads an extra day). Those parts came out rust free and the head bolt tapped out with no problem. The rockers are still a little stiff on the shafts so I'm hitting them with penetrating oil before I take them apart. As I said main purpose of going thru this was to get the rust out of the water jackets and I'm pretty happy with how that turned out. The Poly heads are currently in the tub (with the same solution) and they should be ready to come out about the time I get the block out here. Last edited by Mike P; 12-07-2018 at 02:25 AM. 53 Chevy5, johnboy, 40FordDeluxe and 1 others like this. Now that's a good trick to remember. To de-scale the internal passages of any big chunk of metal is virtually impossible. But that sounds almost too good to be true. Thanks for showing this. 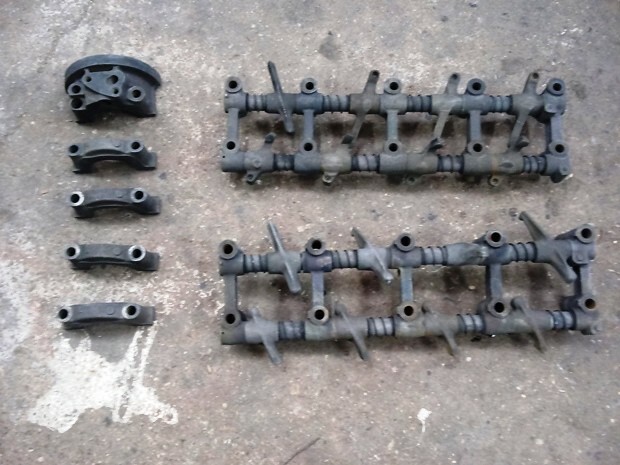 I remember a few times when I was younger I seen some engine parts coming back looking brand new. I always wondered what they used to use. Very nice Mike! I wonder if you added a couple nozzles, a water pump, and a livestock water heater if it would work even better? I may have to try this on a some cummins parts I have. I think you just described a Jet Wash Ryan. Keeping it warm would help….all I had was a small tank heater I used to keep it above freezing a couple of mornings. Dave over at the machine shop told me the caustic solution is still available and I’ve hears of guys using a 55 gal drum with a ring heater to make a poor mans’ hot tank. The problem is getting rid of the solution after you’re done or it gets to the point where it’s not working anymore. I’ve used vinegar to de-rust stuff in the past and the smell gets pretty intense and unpleasant (to me anyway). It’s also more expensive than the citric acid. The citric acid doesn’t have near the smell and what you smell mostly is kind of lemon scented. Basically when you’re done de-rusting what you have left over is rusty un-sweetened lemonade. Dave Severson, 53 Chevy5, cffisher and 1 others like this. It's been mostly cleaning and inspecting parts. 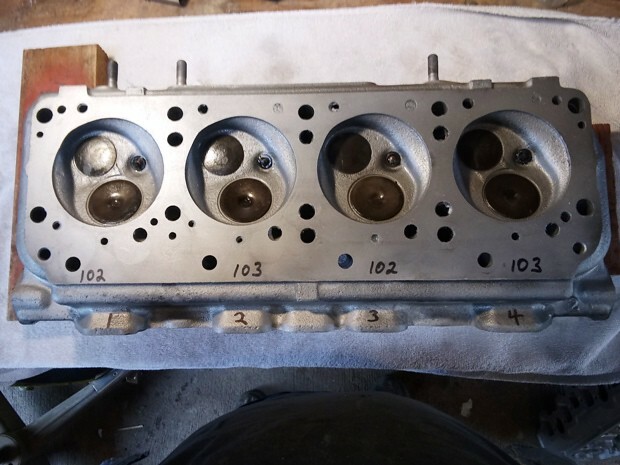 One of the Hemi heads is pretty badly pitted and going to take a fair amount of milling. Dave and I have been discussing options to save it if I can't find a replacement. The other head looks good and once it was cleaned up I got it CCed to get a base line of where we were at with that one. Chamber volume came in between 100 and 102 CCs (from what I can find advertised volume is 103 CCs). I also got the first pair of Poly heads cleaned up. The intake side looks just like a first Gen Chrysler Hemi. The exhaust side ports are considerably smaller than the HEMI head but still decent size for a 354 CI engine. The bigger surprise was chamber volume. 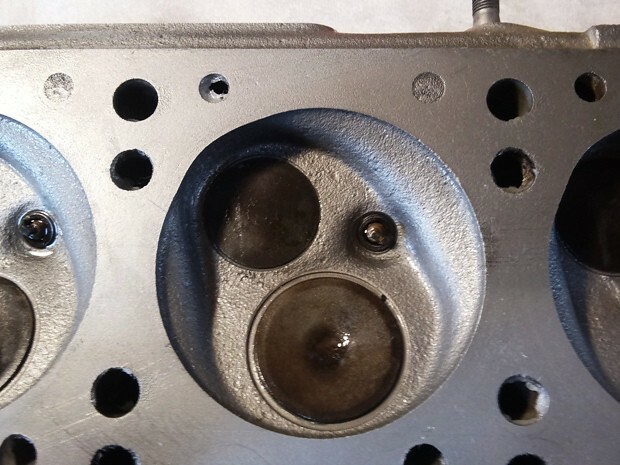 Common belief (including mine) is that Poly heads have a much smaller combustion chamber than the Hemi heads and that when doing a head swap to convert a Poly to a Hemi that a piston change is required to get the compression back up. A glance at the chambers would seem to confirm that. Actually CCing the chambers tells a completely different story. On the first 2 heads that I checked chamber volume ranged between 102 to 104 CC (the 104 cc chamber was on the other head). Practically speaking going from Poly to Hemi or the other way around will not cause a compression change. Once I get the other pair of heads cleaned and inspected we'll make the decision on what two to build. 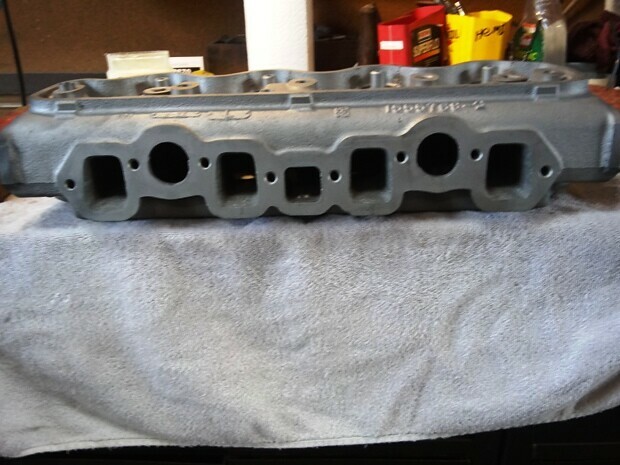 These 301 Poly heads and the 331 2 bbl heads use a 1.812 intake valves. 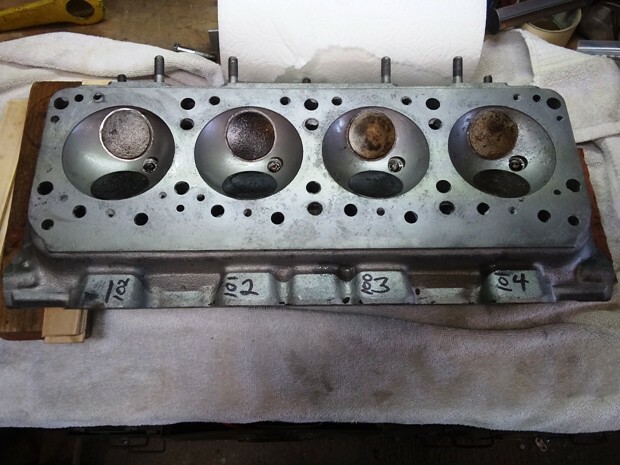 I've already picked up a set of the 331 4bbl/354 intake valves that are 1.94s. 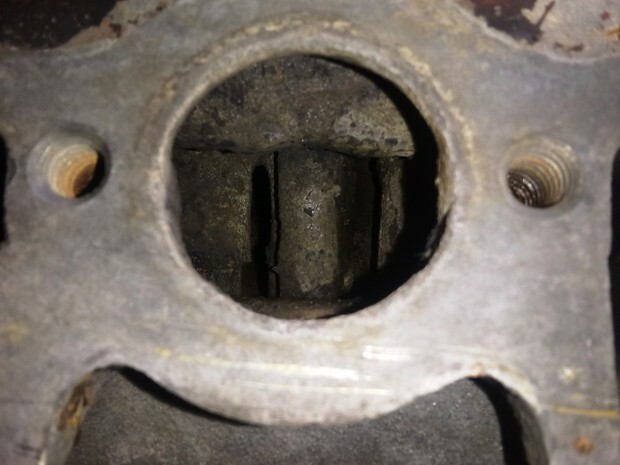 All the Poly heads used a 1.5 exhaust valve and Dave and I are currently looking into a cheaper and larger alternative to the stock exhaust valve. I've also been looking at the options for a roller cam.......any of the HEMI guys out running a street roller cam they would recommend? I wish I could give you any ideas. I'm considering getting a roller cam for mine just to help reduce issues. Mike, If you are after a recommendation get on Facebook and find Nick Smithberg from Smithberg racing. This guy is a genius on early hemi's (I bet he knows polys too) he competed in the Engine Masters with Gene Adams team and is real sharp. He stunned everyone this past year with a variable length intake runner system on a early hemi that adjusted while the motor was on the dyno! He is very willing to help also, and strangely he is a young guy who loves the early stuff. I am going roller on my 392 build but it has .525 lift, thus the reason for the roller rockers, knocking out being a "economical choice". Mike P, 53 Chevy5 and 40FordDeluxe like this.